Who says useful has to be boring? Liven up your kitchen & dining room with colorful cotton hot pads. A simple bottom layer dressed up with a lacy overlay makes a piece you won't need to hide away in the drawer when it's not in use. Best of all, NO seaming. The layers are attached with the final round of stitching. 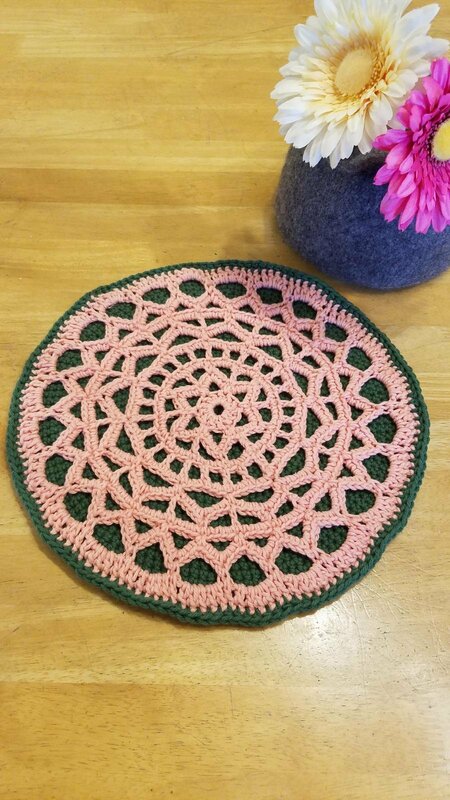 These hot pads are a quick and fun way to show off your crochet skills. They are both decorative and functional, making them a great gift idea. Practical, portable and pretty. You'll find it hard to stop with just one. The perfect house warming gift. Even if you don't cook, they can be used under potted plants or just on the table for a simple pop of color. Materials: 2 skeins Creme de la Creme (1 each in 2 different colors), Size H (5mm) crochet hook, Removable Stitch Marker, Darning Needle. Pattern provided in class.